Santa Ana winds picked up again Monday and were expected to continue into Tuesday as firefighters battling the deadly Woolsey Fire in Los Angeles and Ventura counties worked to hold back the flames. LAST UPDATED: November 12, 2018 at 8:35 p.m.
MALIBU (CNS) - Santa Ana winds picked up again Monday and were expected to continue into Tuesday as firefighters battling the deadly Woolsey Fire in Los Angeles and Ventura counties made slow but steady progress against the flames. In an abrupt about face from Twitter attacks last week against California's forest management, President Donald Trump has tweeted that he has approved an "expedited request" for a major disaster declaration for California. "Wanted to respond quickly in order to alleviate some of the incredible suffering going on. I am with you all the way. God bless all of the victims and families affected," Trump said. As of 7 p.m. Monday, Cal Fire has reported at least 435 structures were destroyed, 24 structures were damaged and the estimated number of structures threatened remained at about 57,000. The blaze has now burned about 93,700 acres and was 30 percent contained, with full containment not expected until Thursday, Cal Fire said. Two people have died and three firefighters have been injured battling the Woolsey Fire. A Red Flag Warning for Los Angeles and Ventura counties was extended through Wednesday. Motorists should look for "No Parking" signs posted in the Very High Fire Hazard Severity Zones. Illegally parked vehicles in the Red Flag zones will be towed, said Los Angeles Fire Department spokeswoman Margaret Stewart. For a map of those zones, go to www.lafd.org./news/woolsey-fire, Stewart added. Santa Ana wind gusts reached as high as 60 miles per hour in parts of Ventura County on Monday and heavy gusts could follow Tuesday, National Weather Service Meteorologist Curt Kaplan said. Winds in mountain areas could average 50-60 mph and gust to 70 mph Tuesday and foothill and coastal areas are expected to see 35-50 mph winds. Winds will be strongest in the mornings and early afternoons, giving firefighters a nightly reprieve, Kaplan said. Cal Fire reports their main priority was making sure any hot spots in Malibu Canyon don't cross into Topanga Canyon, because said a falling ember has more than a 90 percent chance of igniting brush, authorities said. While some evacuation orders for county communities remained in effect, all mandatory evacuation orders for the City of Los Angeles were lifted as of 7:47 p.m., Stewart said. 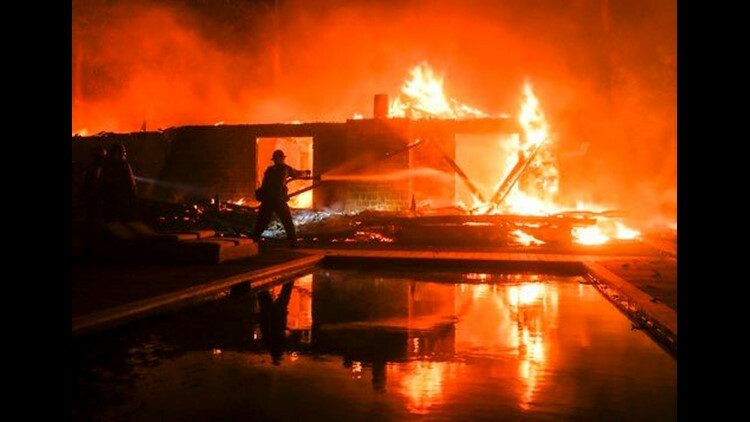 Additionally, the Los Angeles County Sheriff's Department announced that repopulation has begun for Agoura Hills, Westlake Village, Oak Park, North Ranch and Newbury Park residents affected by the fire. Cal Fire announced Monday evening that evacuation orders have now been lifted for West Hills in Los Angeles and Bell Canyon in Ventura County. The California Highway Patrol reopened the northbound and southbound Ventura (101) Freeway from Valley Circle Boulevard. Pacific Coast Highway remained closed to all traffic from the Ventura/Los Angeles County line to Sunset Boulevard. Some 3592 firefighters were assigned to battle the blaze. Meanwhile, 22 helicopters worked from above, officials said. A total of 619 engines, 48 water tenders, 23 bulldozers and 57 hand crews were sent into the battle, Cal Fire reported Monday evening. Firefighters also had to deal with a fast-moving brush fire along the 118 Freeway near the Los Angeles/Ventura county line, which burned 105 acres and forced the immediate evacuation of Box Canyon and Lake Manor residents. It was reported about 10 a.m. Monday and knocked down a couple hours later, with no injuries reported. The fire has also caused the closure of libraries in Agoua Hills, Malibu, Topanga and Westlake Village. There's no word yet on when the libraries would reopen. Meanwhile, the California Public Utilities Commission was investigating Southern California Edison for its possible role in the fire. According to CPUC, electrical infrastructure may have suffered malfunctions near ground zero of the blazes two minutes before they began. The agency also is investigating PG&E for its possible role in the Camp Fire in Butte County, which has burned 113,000 acres and resulted in at least 42 deaths. Los Angeles County Fire Chief Daryl Osby and others expressed frustration with residents who failed to evacuate, saying they were hindering firefighters, and urged residents to stay away. Osby also said crews were working around the clock to build containment lines, knock down flare-ups and update damage numbers. And despite messages to the contrary on social media, officials are not escorting residents back into the evacuated areas to retrieve medications, Los Angeles Police Lt. Eric Bixler said. A town hall meeting about the fire was held Sunday at Taft Charter High School and attended by hundreds of concerned residents from the west San Fernando Valley down to Malibu. The tense, standing room only crowd was given briefings by representatives of law enforcement, fire departments, school districts, utilities and politicians. Sheriff's deputies have been put on 12-hour rotational shifts, with 500 to 600 deputies available to patrol the affected areas, Los Angeles sheriff's Chief John Benedict told the town hall crowd. Benedict also said the badly burned bodies of two people were found inside a burned vehicle in a long driveway in the 33000 block of Mulholland Highway. Questions were raised online and at the town hall regarding the possible danger of radioactive dust posed by the fire since it had burned through the former Rocketdyne site at the Santa Susana field. And many residents expressed frustration at not knowing when they would be able to return to their homes. A representative from the state's Department of Toxic Substances and Control told the crowd that his office had sent a monitoring team to the area that found no evidence of radioactive ash posing a threat. He said the team would continue monitoring the site for problems. However the DTSC representative did not stay to take questions. Malibu City Councilman Skylar Peak said residents cannot reenter Malibu for safety reasons until the mandatory evacuation order is lifted. He also asked those people to refrain from attempting to get back into Malibu by boat. There are still about 3,500 students sheltered at Malibu's Pepperdine University, Benedict said, bringing an angry reaction from a number of Malibu residents who asked if resources were being diverted from protecting houses in Malibu to protecting Pepperdine University. Los Angeles County Fire Chief David Richardson tried to quell the anger by explaining the situation at Pepperdine. "Pepperdine has a long-standing understanding with the county fire and sheriff's departments," Richardson said. "Pepperdine is a large facility that can support a large number of people. It was a viable option." He also told the crowd that a ballpark figure for their return to Malibu was three to five days. Another community meeting for Malibu-area evacuees was scheduled for Tuesday night at Santa Monica High School's Barnum Hall. Chris Thompson of SCE said there were 13,000 customers who initially lost power, mostly in Malibu, and now that number has been reduced to 9,000. He also said that it will take time to replace the telephone poles destroyed by the fire, especially in canyon areas. He said they will need to use a helicopter to bring in the new poles. "We can't just drive poles in on a truck to those areas," he said. For residents waiting and watching to hear about their homes, law enforcement offered reassurances about patrol presence. There were "zero incidents of looting or burglary in the affected areas," Bixler said. Peak said more than 50 homes have been lost in the Point Dune area, and more than half the city was without electricity Sunday. Officials said Malibu City Councilman and Mayor Pro Tem Jefferson "Zuma Jay" Wagner was recuperating at a hospital from conditions related to his unsuccessful efforts to save his home Friday night. The fire -- which began Thursday afternoon -- has forced the evacuation of at least 75,000 homes and an estimated 265,000 people in both counties as it indiscriminately consumed multimillion-dollar mansions and mobile homes. In Malibu, Pepperdine University said the school's Malibu and Calabasas campuses would remain closed through Thanksgiving. All Malibu schools in the Santa Monica Malibu Unified School District will remain closed until at least Thursday, the district announced. City officials said there will likely be intermittent power outages due to weather and fire conditions. Fire information for Los Angeles County can be found at www.lacounty.gov/woolseyfire. The Conejo Unified School District, which includes parts of Los Angeles and Ventura counties, closed its schools for Tuesday after inspectors found that at least two schools required major clean-up. Orange County Fire Authority officials say they have sent 20 engines to assist with the fires, and firefighters have come in from off time to ensure that every OCFA fire station is adequately staffed. Crews from other agencies, including Arizona, were also assisting in battling the massive blaze, helping to evacuate residents and providing traffic control. The Federal Aviation Administration sent a tweet reminding drone operators that they could face severe civil penalties and potential criminal prosecution for flying drones over fire areas. Meanwhile, firefighters made progress on the much smaller Hill Fire north of Malibu and south of Simi Valley. That wildfire, which has consumed about 4,500 acres and destroyed two structures, was 80 percent contained. No civilians or firefighters were killed or injured and full containment was expected Wednesday. Those in Ventura County needing assistance with large animals were advised to call (805) 388-4258.